This interesting shiny hand-out features a pair of BL Morris Marinas, parked outside the Victoria Garage, in Whitchurch. This garage is still in use, located just near the roundabout in Whitchurch, and a modern-car sales business is there, alongside a Shell petrol station. This particular advertising card, which measures 6" x 4.5", was used as a postcard and posted from nearby Nantwich, to a young lady in Liverpool, March 1977. 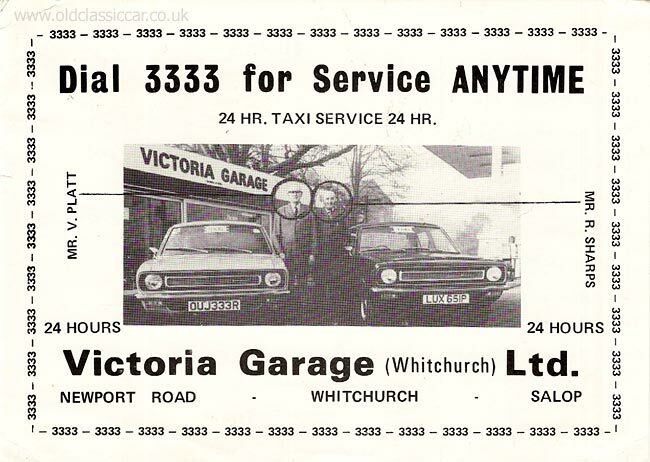 As far as I know, there is no longer a taxi service operating from Victoria Garage, and if there is, I doubt very much that they are still using either of these Marinas! Does either Morris still exist? a quick look on the Motor Vehicle Licencing site shows that OUJ 333R is still on the system, but no mention of whether it is still taxed and on the road. We're told that the car was first registered on 1st August 1976, 1st day for the new 'R' registration letter of course back in the 70s. It was powered by the 1275cc A Series lump, and was finished in a fetching shade of British Leyland beige. The Morris taxi parked alongside, LUX 651P, is also still on the DVLA records but again no mention of it currently being taxed. This example was finished in maroon, also had the 1275 engine, and was registered a little earlier in 1976 (4th February to be precise). Does anyone know what became of either Marina? or do you remember taking a ride in either of these taxis? Photographed in-between the two cars are two respectable looking gents, perhaps the owners of the garage, or just the taxi operators who operated from the site? to the left is Mr V. Platt, and on our right, Mr R. Sharps. As already mentioned, this garage is still in existence (see their website here). We're told that the garage has been in existence since 1948, and on this particular site since 1956. Last time I drove by there were no Marinas in the showroom!